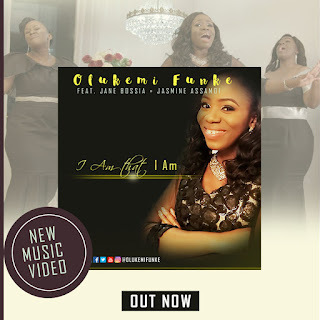 Gospel Music minister, Olukemi Funke releases the official music video for her latest single “I Am That I Am” featuring Jane Bossia and Jasmine Assamoi. Olukemi is a British/Nigerian who started singing from a very young age. She had the passion to sing and so kept asking her parents to take her to the studio to let her sing and record songs. As God would have it, she had the privilege to sing a solo at her Foursquare Gospel Church Okota, Lagos Nigeria at the age of six (6) during one of the Children/Teenage programs. She continued to sing whenever she had the opportunity to. During one of her ministrations at Federal Government Girls College Oyo, where she ministered ‘I will say yes’ at age 11, she did not only minister to people at the service that day but also to herself. It became clear from some of the testimonies of those she ministered to and her testimony from same ministration that God wanted her to spread the gospel of Christ through the instrument He had given her (her voice).When she completed her Junior Secondary School Education at Federal Government Girls College Oyo Nigeria, she moved on to further her Secondary School Education at Light House Secondary School where she joined the school choir to serve till she completed her studies and furthered her University Education at Covenant University where she was also privileged to serve in the same capacity.Some years later, she relocated to London, where she joined New Covenant Church Edmonton, London UK choir to serve. Olukemi currently serve in the Choir at Winners Chapel Dartford and has been priviledged to release her first single titled Highest Praise from her forthcoming album Unlimited God. In 2013 She received an award for Praise and Worship act under the Praisetek Gospel Music Award. In 2014, she got nominated for Artist of the Year Europe under the African Gospel Music Awards and Best Gospel Act under the True African Heritage Award. Olukemi Funke released her first album a praise and worship album featuring thirteen tracks all given by the inspiration of the Holy Spirit on the 14th of November, 2015. It features songs like Highest Praise and Super. In 2016, Olukemi Funke was nominated for GXMMA award for afro gospel artiste of the year.